Jerome Millerand is proud to say that if he does not find you, you can always find him. As one of eight such agents in one commune in Haiti, Millerand is on the front lines of the country’s war on malaria. Trained and equipped with the support of the U.S. Centers for Disease Control and Prevention (CDC), Millerand goes literally door-to-door in the community of Dilaire, in Haiti’s northeast department, testing anyone showing symptoms of malaria, treating anyone who tests positive and monitoring neighbors for the disease. 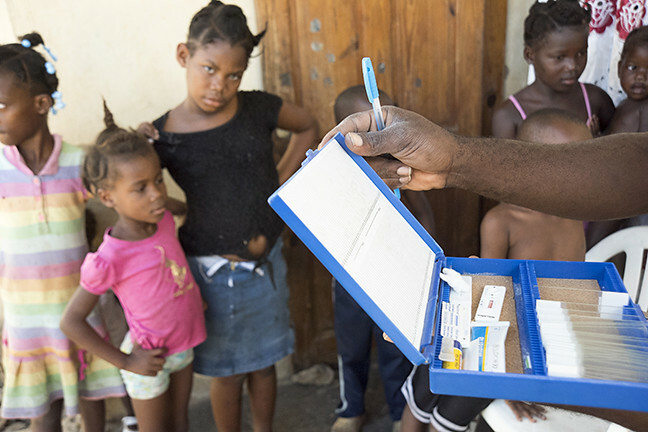 It is active disease surveillance, and for CDC, it represents a key element of a new initiative aimed at eliminating endemic malaria from the Caribbean entirely. Comprised of Haiti and the Dominican Republic, Hispaniola remains the last stronghold of endemic malaria in the Caribbean. In Haiti, the hardest hit of the two countries, more than 17,000 malaria cases were diagnosed in 2014 alone, proving both a health risk and an obstacle to economic development in the country. Led by CDC and managed by the CDC Foundation, Malaria Zero seeks to bolster existing systems already in place on the island. As with all such efforts, there are challenges. Haiti remains the poorest country in the Western Hemisphere, with limited health and physical infrastructure. In addition, Haiti is beset by a range of public health challenges, including cholera and the presence of other mosquito-borne diseases, such as Zika virus. But, says Dr. Stanley Juin, a monitoring and evaluation specialist for CDC Haiti, the country has made significant progress, particularly in disease surveillance, since a devastating earthquake struck Haiti in 2010. Coupled with that capacity building, CDC has provided a wide range of training and equipment for technicians at Haiti’s National Public Health Laboratory in Port-au-Prince, including support for an insectary that was established from funding provided through another agency. In the insectary, lab staff can test the efficacy of insecticides being used to control malaria-causing mosquito populations. With the support of the Malaria Zero, the health ministries of both Haiti and the Dominican Republic are also working closely together sharing information about infected individuals who cross the shared border and need to be treated. As such, both ministries meet regularly to exchange information, plan joint elimination strategies and reinforce each other’s technical approaches. And while ambitious, says Dr. Chang, the goal of eliminating malaria from Haiti by 2020 is readily achievable if more support for the effort can be secured. To fully implement the Malaria Zero strategy, which builds on Haiti’s National Malaria Strategy, additional resources are needed to increase malaria surveillance in the field and in hospitals, diagnose and treat all malaria cases and use a targeted package of interventions, such as drug administration in communities and controlling mosquito populations, to disrupt the disease. Finally, after the island has been without local transmission for three years, it will be certified malaria-free by the World Health Organization. Back in the community of Dilaire, Jerome Millerand’s focus is more acute. In just a few minutes of home visits, he has tested three people showing signs of fever—all negative for malaria today. Unable to pursue his dream career in medicine, Millerand says he is giving back in ways that matter nonetheless as a quiet but passionate sentinel on guard against malaria in Haiti.